Frying isn't the only way to cook pork chops on your stovetop. Pan-searing gives this juicy cut of pork a crusty, well-browned interior; you simply cover the pan to finish cooking the chops to perfection. It also makes for a quick and easy dinner option. You can enjoy your pork chops just as they are or with a complementary addition, such as sauteed apples or a honey-mustard sauce.You can also grill the pork chops on a grill pan on the stove, or cut them up and toss them into a wok for a stir-fry. Brush your pork chops with olive oil, then season them liberally with salt and pepper. You can apply additional seasonings as well, including garlic powder, chili powder, mustard powder and fresh herbs like oregano, thyme and rosemary. Coat a large skillet with just enough canola oil to cover the bottom; place the skillet on the stove over medium-high heat. Add your pork chops and sear them on each side until they are well-browned, about 3 to 5 minutes. Use metal tongs to flip them. Reduce the heat to medium and cover the pan to allow the pork chops to finish cooking. Cook the chops to a minimum temperature of 145 degrees Fahrenheit when checked with a meat thermometer. Brush a grill pan with olive oil or canola oil and bring to a high heat on the stove. Season your pork chops with salt, pepper and any other dry seasonings, to taste. 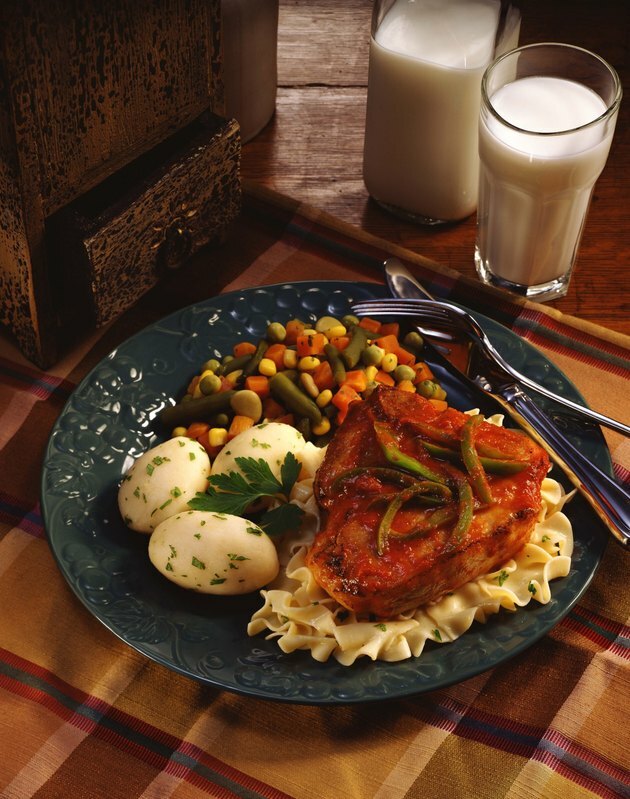 Cover the pork chops in flavorful sauces, such as honey mustard or teriyaki, if desired. Place the pork chops on the hot grill pan and cook for about 8 to 10 minutes on each side, until the pork has slightly charred grill marks and has reached an internal temperature of at least 145 F. Use tongs to lift the pork chops and grill the sides as well. Place your pork chops on a clean cutting board; trim off the fat; and slice them into strips, about a 1/2 inch thick. If your pork chops are bone-in, you'll need to slice the pork off the bone first. Place the pork chop strips in a soy sauce and sesame oil marinade in a large reseable bag and allow them to marinate in the refrigerator as you prepare the other ingredients. Slice bell peppers into thin strips about 1/4 inch thick, then cut them in half lengthwise. You can also chop up other vegetables to include in the stir fry, such as broccoli and onions. Drizzle a tablespoon or so of oil in a wok or large skillet and bring to a medium-high heat on the stove. Add the vegetables, stirring them frequently in the wok, until they start to soften. Add the pork chop slices to the wok or pan, mixing them up with the vegetables. Cook until the vegetables are softened and the pork chops are cooked through to an internal temperature of 145 F.
Marinate your pork chops the night before in a complementary sauce or dressing, such as a honey-mustard vinaigrette, to infuse the chops with even more flavor.